Zone 9 is at the southern end of the nut growing region--it does not give gardeners as wide a choice as those further north have. Nut trees range in size from small to very large with the majority being very large, but nut lovers appreciate being able to grow any variety for their own use and as part of a wildlife garden. Nut trees produce an abundant crop and there will be plenty to share with the local animal and bird populations. Black walnut (Juglans nigra) is suitable for large properties. Pecan (Carya illinoensis) is the state tree of Texas and is another tree that needs space to grow. American filbert (Corylus Americana) is a small tree suitable as a specimen tree on small properties or as a group on larger ones. Black walnut grows to a height of from 70 to 100 feet with a spread of 60 to 80 feet. Pecan trees reach a height of 70 to 100 feet and a spread of 40 to 75 feet. American filbert grows from 8 to 15 feet tall and 8 to 12 feet wide. 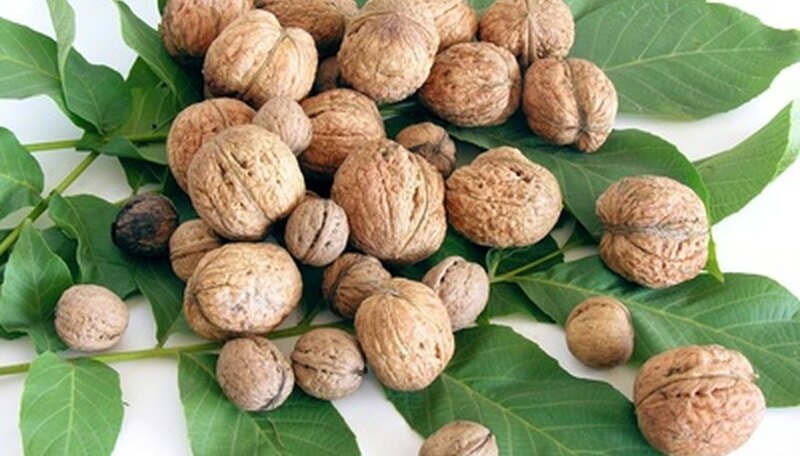 Black walnut produces green, compound leaves made up of egg-shaped leaflets each 2 to 4 inches long and tiny flowers that bloom in the spring and are followed by nuts 1 to 3 inches long. The leaves of the pecan are compound, lance shaped with each leaflet from 4 to 8 inches long and turn yellow in the fall. The flowers are yellow, bloom in the spring and produce nuts 1 to 3 inches long. American filbert features green, egg-shaped leaves from 4 to 8 inches long that turn yellow or orange in the fall, brown flowers that bloom in the spring and brown nuts that measure up to 1 inch long. Black walnut grows in a moist, rich soil and is found growing along stream banks. The tree likes full sun and a well-drained soil. Pecan grows in full sun or partial shade and a well drained soil. The tree is drought-tolerant. American filbert likes partial shade and a moist to dry soil. Webworm larvae, tent caterpillars, mites and scales cause damage to the black walnut and the tree is susceptible to brown leaf spot, canker, bacterial blight and powdery mildew. Pecan trees are susceptible to insect and disease damage. American filbert is relatively pest and disease free.